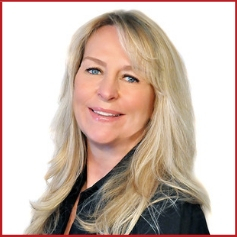 Valerie Brousseau draws on over 26 years of real estate knowledge while assisting her clients reach their goals! As an experienced coach, trainer and author, Valerie uses her genuine love of helping people to customize each and every coaching program, focusing on the “nitty-gritty” of personal and professional implementation. Over her career, Valerie has written and published “How to Hire an Assistant” for agents and has also worked with top agents and real estate teams across Canada and the United states including Vancouver, Texas, New York, Seattle and California. While holding the title “Manager of Business Development” Valerie is responsible for providing on-going training to “seasoned” and new agents while helping them all achieve outstanding excellence. Valerie inspires all of those around her daily with her robust laughter and enthusiastic outlook on life in the profession of real estate.